Thank you to everyone who attended CREATIVE ZONE Marketing Services Open House yesterday. As always, we had a wonderful turnout and we're so happy to meet with all of you. Presentation Summary: Startups lack the finances and are often short on resources. Yet they have to find ways to compete with the bigger players in their domain. Not only that but new players are getting launched on a daily basis. They also have to try their utmost to make their presence known in a sea of marketing campaigns from companies with unlimited budgets. So how do they survive and get themselves noticed? Luckily, digital marketing allows companies to get amazing exposure even those with shoe-string budgets, therefore making it an absolute necessity for start-ups to explore and build a long terms strategy around. In the upcoming presentation, we will explore how social media platforms can be beneficial to your start-up and how a few changes to your website can be the difference between being invisible online and getting regular, high levels of traffic. use Social Media effectively to build a strong digital brand. Presentation Summary: Every organization, no matter how large or small, ultimately depends on its reputation for survival and success. Customers, Internal and external stakeholders have a powerful impact and they all have an opinion whether good or bad, right or wrong. These perceptions will drive their decisions about whether they want to work with, shop with and support these organizations. We hope that you found the Open House informative and worthwhile. 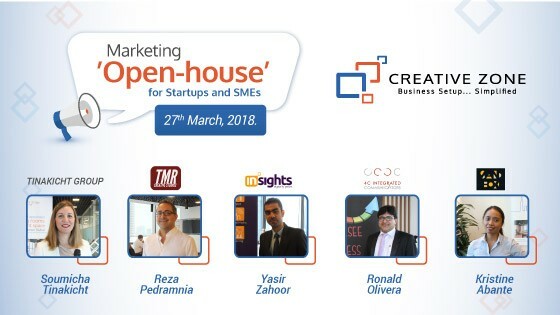 The primary goal of this event was to bring together enpretreneurs in an open dialogue and learn more about PR, design and marketing strategies which are helpful in the gowth of startups and SMEs in the UAE. We truly appreciate your support. We hope to see you again at our next corporate event.